Fans of mobile RPG Mobius Final Fantasy have every reason to celebrate the new year as we kick off 2018 with the Summon Festival in-game event. Featuring enticing additions to the summoning lineup, the limited-time Summon Festival marks the best time ever for players to obtain some of the game’s most elusive and exclusive cards, and to test their wits and obtain prizes. What's in store during the New-Year Summon Festival 2018? Supreme Card Summon: From now through January 5 at 11:59 PM PST, players who purchase at least 12,000 magicite will receive a Supreme Ticket allowing them to perform a Supreme Card Summon, which grants one unobtained Supreme Card or one unobtained Ultimate Hero Card. Supreme Card Lineup: Lucky fans have the chance to summon Supreme cards that feature iconic characters from classic FINAL FANTASY titles with some of the game’s strongest abilities, including Aerith with the Great Gospel ability from FINAL FANTASY VII, Duncan with the Phantom Rush ability from FINAL FANTASY VI, and more. Ultimate Heroes Lineup: Lightning with the Ranger job type and Cloud join the permanent roster of Ultimate Heroes that may be summoned. Palamecian New Dawn 2018: To celebrate the new year, a new region, “Palamecian New Dawn 2018” has been unlocked for all players. Through this new time-limited region, players can get free summons, a chance to obtain magicite and other rewards. 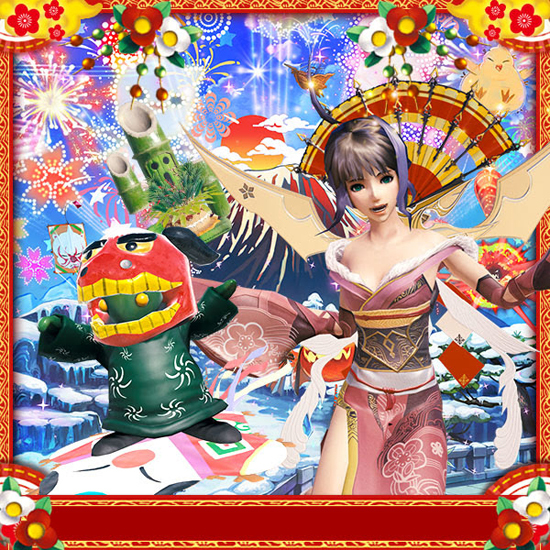 All players who visit this region will also receive an adorable new year themed Echo companion spirit. New Job: The all-new Ninja job card will be permanently included in the game’s summoning lineup. New Boosted Ability Cards: The Mist Dragon, Prometheus, Omniscient, and Chocobo Saint ability cards are now permanent additions to the game’s summoning lineup. FINAL FANTASY RECORD KEEPER Collaboration Card: In a new game collaboration, players can now summon one of eight event-exclusive FINAL FANTASY RECORD KEEPER cards as a bonus each time a Greater Summon is performed. Tyro returns a guest card, and each player will receive a “Dr. Mog” card just for logging in. Bahamut Lagoon: Beginning January 11, players can explore the Bahamut Lagoon isles where the Sicariuses slumber, and defeat them for the chance to obtain ★5 fractal cards. Mobius Days on January 8, 18 and 28: Days in January that end with “8” bring forth a bounty of bonuses, including an extra 88 stamina upon first login, double stamina from elixirs, 20% greater fusion success rates, special gifts and much more. Hall of Fame Additions: Fans can obtain the true power of the Red Mage starting January 9, experience the overwhelming offensive ability of the Samurai on January 16, and transform into a breaker with the Assassin on January 23. MOBIUS FINAL FANTASY is available now as a free download on the App Store, Google Play and now in full HD on PC Steam.